As part of the 2018 Commencement Weekend, Pardee RAND held a Demonstration and Dialogue event on Friday, June 15 to introduce alumni, board members and friends to some of the new elements of the redesign the School is currently undertaking. After the demonstrations, participants gathered for a panel discussion on the Policy Design Studios—another new element of the Redesign. 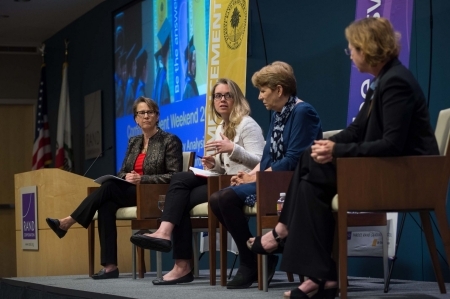 The panel featured third-year student Lauren Davis (cohort '15), Integrated Recovery Network executive director Marsha Temple, and Pardee RAND professor Ann Pendleton-Jullian; Dean Susan Marquis served as moderator. The three demonstration projects allowed participants to reflect on language use in online discourse, get a glimpse of a new online learning course Pardee RAND is developing, and interact with real-world environments with an augmented reality display showing 3-D map information with overlays of other data streams. 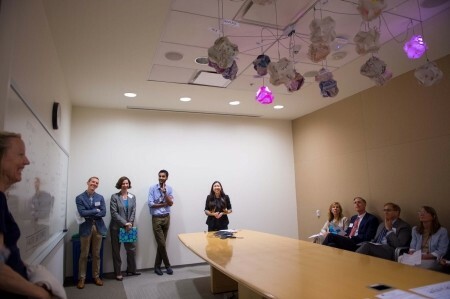 A tech lab pilot art installation and data visualization platform, Atwitter allowed participants to view lamps that lit up with certain Twitter hashtags and message content. The project was created by student Sara Turner (cohort '15) who built the lamps and programmed them and presented by Karen Lee ('16). Atwitter is intended to inspire viewers to reflect both on language use in online discourse, and on the role that anonymity plays in Twitter space as the author and full content of the tweet is obscured from observers. Sara hopes to display Atwitter in a local coffee shop to observe how the public might respond to it. The second demonstration provided insight into the School’s development of online learning courses. Pardee RAND is partnering with Kings College London to develop anonline course as a pilot for future efforts to deliver Ph.D.-level policy coursework to students, RAND staff, and other RAND collaborators. The goal of this pilot is to better understand the opportunities and challenges of developing effective online learning as we look to lead the future of public policy education methods. The pilot was constructed with RAND input from Prof. Robert Lempert, alum and Prof. David Groves (cohort '01), and Executive Vice Dean Dan Grunfeld. 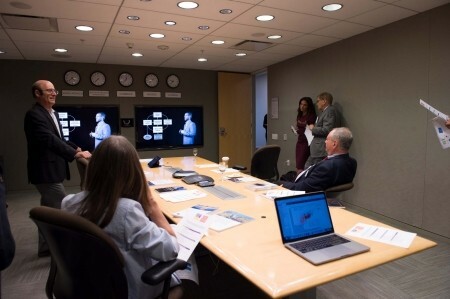 The demonstration featured videos introducing the course sessions and portions of the RDM methodology using and effective blend of interactions between the professors and animated graphics. TNL lead Todd Richmond and RAND’s Director of Emerging Technology, Cord Thomas, led this third demonstration, in which participants could try out a Microsoft HoloLens that displayed 3-D map information with overlays of two other data streams --traffic and Twitter activity. The display was developed by a RAND project led by Zev Winkelman, Aaron Frank, and Kelly Klima. By facilitating an immersive exploration of complex data, the augmented reality display provides policy analysts with new ways to interact with real-world environments that combine multiple layers of content and context. Featuring student Lauren Davis (cohort '15), Marsha Temple of the Integrated Recovery Network, and professor Ann Pendleton-Jullian, the Policy Dialogue provided an opportunity to introduce a new feature of the redesigned school—the policy design studio and to talk about the work first year students did in their first studio on homelessness. Each of the panelists spoke about their perspectives on the studios. Pendleton-Jullian discussed the format of the studios: the first phase of the studio allows students to visualize patterns and map out complex interactions. She is collaborating with the dean and others in reimagining the future of Pardee RAND and leading the School’s efforts in developing its policy and action design studios. The second phase of the studio has students take a slice of a complex problem and imagine how to find solutions to that problem. In the third phase, students create a final product that takes the system as a whole and addresses different mechanisms for solving the problem recognizing that that problem operates as a complex system. She said she thought students changed their perspectives on the issues of homelessness over the course of the studio. They gained greater appreciation and respect for the homeless, problems related to poverty, and the seriousness of these issues as a complex policy problem. Davis discussed the way the studio gives students a toolkit for addressing complex problems: they learn what kinds of questions to ask, develop a common terminology, learn to visualize and map complex problems, and learn to creatively solve problems. In 2016-17, she participated in two pilot projects for the Redesign: the pilot Policy Design Studio on Equitable and Effective Policing and the TechLab pilot. In 2017-18, she observed the first-year policy design studio on homelessness as part of her role in helping design the curriculum for a policy design studio on water that will be taught as an elective in 2018-19. Temple, the founder and Executive Director of Integrated Recovery Network,a social service agency near downtown Los Angeles that helps people who have been homeless by providing them with access to housing, health care, education, and jobs, spoke to students in the studio as a community expert and also observed their final presentations. She commented that not only did she feel like she learned new information from the student presentations, but that the solutions proposed were thoughtful and insightful. Moreover, she felt that many of them could actually be put into practice.